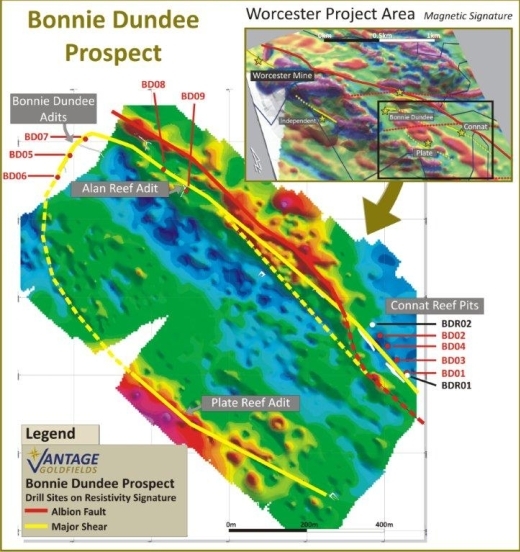 Phase 1 of the exploration program at Bonnie Dundee, which is located adjacent to the dormant Worcester Mine, was completed during 2012. The objective of this field prospecting exercise was to establish continuity of known mineralized zones and, hence, determine whether these could potentially provide critical mass for possible underground operations at the Worcester Project. Prospecting activities resulted in a preliminary mineral resource of 510,000t @ 3.47g/t (56,700 oz) being delineated, where mineralized shears display a strong geophysical signature. Limited diamond drilling and sampling of shallow, underground, prospect adits have been sufficiently indicative of shear-hosted gold mineralization to warrant further investigation. A further phase of exploration will be undertaken in due course. The dormant Bonanza Mine, which is adjacent to the prolific Sheba Mine, an operation that has been producing continuously since 1884, is being re-investigated for strike and depth extensions of the known ore body. 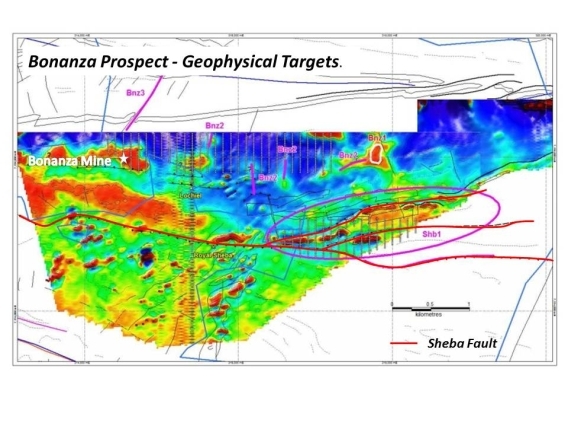 A field exploration program has commenced with the objective of testing for further ore bodies possibly associated with prominent geophysical anomalies occurring along the Sheba Fault and other subsidiary structures controlling gold mineralization in that area of the Sheba Hills.